In September 2017, SMU’s Central University Libraries uploaded 120 items into CUL Digital Collections. [Barack Obama and Joe Biden Jugate Inaugural Medal], 2013, DeGolyer Library, SMU. 6 presidential inaugural medals in the Hervey A. Priddy Collection of Presidential and Political Memorabilia, which depict each president from President George H. W. Bush through President Barak Obama. The set includes the Barack Obama and Joe Biden Jugate Inaugural Medal which was designed in 2013. Untitled (Silhouette of Jerry Bywaters), 1933, by Hariett Phillips Grandstaff, Bywaters Special Collections, SMU. 16 works of art in the Texas Artists – Paintings, Sculpture, and Works on Paper collection, including pencil works, relief prints, serigraphs, a lithograph in watercolor, a silhouette, a tempera painting, a charcoal drawing, and an aquatint. The majority of items were created by women artists. Among the items are studies of maguey plants, still lifes, people, and works which either portray an artist or artists at work. Of special note is Octavio Medellin at Work, Villita Art Gallery and Untitled (Silhouette of Jerry Bywaters). 1 booklet from the Doris A. and Lawrence H. Budner Collection on Theodore Roosevelt, showing the grounds and facilities of Jack Cooper’s training camp, a physical fitness center in Connecticut that President Roosevelt visited after his presidency. Guide Map of Yellowstone National Park, 1939, a map that provides information to motorists visiting Yellowstone National Park, including lodging, rules and regulations, and a number of attractions. 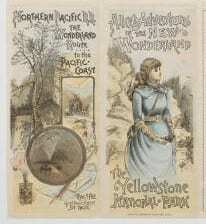 Map of the Yellowstone National Park, 1886, a map and informational guide featuring a narrative written from the perspective of Lewis Carroll’s Alice from Alice in Wonderland. The guide was published by the Northern Pacific Railroad Company to promote their route to the Pacific Coast. 1 negative from Collection of Dallas Morning News Negatives and Copy Photographs showing the exterior of a woman’s college in Dallas. 50 obsolete and canceled scrip, notes, audited drafts, and treasury warrants, ca. 1836-1869, from the Rowe-Barr Collection of Texas Currency held by DeGolyer Library. Uploaded were notes and other forms of currency dating from the establishment of the Provisional Government of Texas in 1836 to the Reconstruction era after 1865. Municipal scrip originate from Washington-on-the-Brazos and the city of Austin. County scrip originate from Wharton, Williamson, Wilson, and Wood counties. Audited drafts originate from Austin, Washington-on-the-Brazos, and the Provisional Government of Texas. Also included is a treasury bond certificate from Austin, treasury warrants from Austin and Washington-on-the-Brazos, and city land scrip from Washington-on-the-Brazos. Several of these notes, scrips, drafts, and warrants were issued to pay participants in the Texas Revolution and U.S. Civil War for military service and supplies. Private scrip also originate from the Corporation of the City of Washington in Washington-on-the-Brazos and from the companies of W.C. Wilson & Co., Bailey, Gay & Co., R.C. Martin, and Bishop Blythe & Co.
4 Baldwin Locomotive rosters from the Collection of Baldwin Locomotive Works records. The rosters each cover 5,000 construction numbers, and these four volumes list the company’s work for the years 1889 through 1907. 8 photographs relating to the Orange and Alexandria Railroad used by the Union Army. Of particular interest is a photograph of the aftermath of the derailment of the “Commodore” locomotive by the Confederate army after the Battle of Second Manassas. 5 items from the Lucy Pier Stevens Papers, including the diary Lucy Pier Stevens kept between 1865 and 1867. Among the items uploaded are ephemera including newspaper clippings with various items of trivia, a cloth list, and a note to Lucy from a family member. 4 drawings from the Collection of Baldwin Locomotive Works records. These drawings, from the years 1902 to 1909, include a proposal for an unknown railroad client. This entry was posted in Railroads, Texas artists, Texas photographs, U.S. West. Bookmark the permalink.